We haven’t seen an awful lot of Rouge in the Archie Sonic comics, have we? That could be about to change, if a message from comic writer Karl Bollers is any indication. According to a post on Ken Penders’ message board, the Bat Girl will be making a re-appearance later this year in the mainline comics. 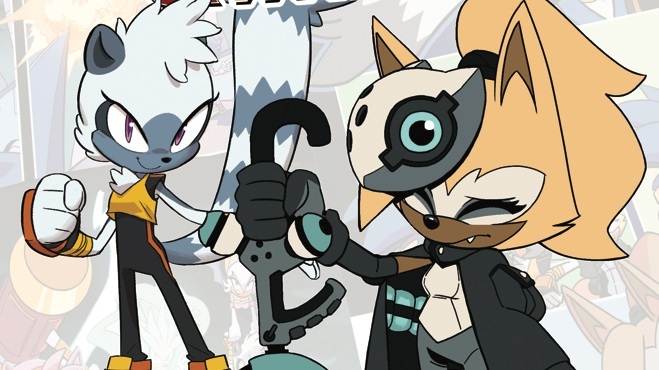 The last time Rouge was spotted in print was during a cameo in the Sonic Adventure 2 adaptation back in Sonic #98, so this is welcome news! More on this as we get it. There’s an awful lot of swashbuckling and arrow-flinging action happening in the next upcoming issue of Archie Comics’ Sonic the Hedgehog: as the Sword of Acorns is under threat from a shadowy ninja clan in the main story; and the side story focuses on Rob o’ the Hedge roughing it up with the former high sheriff of Snottingham General D’Coolette. Read on for more, plus cover. The original artwork for Archie’s Sonic the Hedgehog comic, Issue #100, has now gone on sale on eBay. This follows the comments made by Ken Penders, who said it would be going up for auction. The starting bid is $500, but you can buy it outright for $1,500. Click here to see the auction and bid.